I have no idea how I found Emerald Windows by Terri Blackstock. I remember I was scratching for something to read and all the new releases I wanted to read were out on loan at the library. I think that's where I found it. On a list--somewhere in the annals of the digital library. I'm glad I did. You won't find a lot of posts on romance novels here even if they are the staple of many who travel. That's because I'm not a lover of the romance genre. I find it too formulaic. 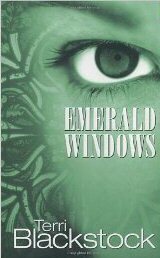 But Emerald Windows broke out of the formula a bit and presented a good story with some great moral conflicts and solutions. Brooke Martin returns to the small town of Hayden that she fled when evil gossip convinced so many that she had had an affair with her art teacher, Nick Marcello. Her purpose in returning is to take on a stained glass window project that has the possibility to propel her career to greater heights. To her dismay and confusion she finds that Nick is actually the one in charge of the project. That dredges up all sorts of old feelings, some new feelings and a whole ton of more gossip when the town's biggest gossip monger takes the couple on and tries to destroy not only their reputations but also their project. This is an easy read and would certainly entertain and engage you on a trip as well as give you a bit to think about when you're done.